I’m a member of two on-line forums, one for IBS sufferers and the other for sewing. I’ve only just joined the IBS forum and was having a little trouble putting a photo on my profile*, so asked one of moderators for help. Within the hour it was there and she couldn’t have been more helpful. The sewing forum has recently revamped it’s website and as a result the date of birth on my profile has somehow changed. As there was a note saying that the administrator is the only person who can make this change, I emailed them yesterday and asked if they would be so kind as to correct it. When I checked my mail this evening there were two mails from the said administrator. The first one was a rather blunt and snotty reply saying it was my responsibly to make that change, and was I incapable of doing it myself. The second mail, which arrived two hours later and again in a blunt manner, said that they had checked the information on the members profiles and as I was unable to make the change myself, they had done it for me. The administrator had a narrow escape for had it been any night other than a Friday**, I would have been at my computer when their first email arrived and they would have felt the wroth of the Customer from Hell ! ! ! As we’re going to Jenny’s New Years Eve party (yippee….) this will be the last blog for 2006. From John and myself, we wish you a very happy and peaceful New Year. * They want the forum to be as friendly as possible, hence the photograph. ** Friday night is Chinese and bottle of wine night. Seeing as I had a bit of spare time I thought I’d answer the 100 questions which were on Gottles blog a couple of days ago. 5. When’s the last time you worked out? You must be joking ! ! ! 12. Favourite mall store? Does Amazon count…. 40. Do you like Chinese food? Oh yes ! ! ! ! 52. How do you like your eggs? In pancakes…. 61. What kind of jelly do you like on your PB & J sandwich? Eh ! ! ! 72. Best thing about winter? Christmas ! ! ! 76. Do you think pirates are cool or overrated? How should I know. I’ve never met one ! ! ! 93. Do you have a crush? That would be telling ! ! ! 98. Have you ever been on a cruise? Oh yes ! ! ! Yes, that’s exactly how we both are following our two Christmas lunches. Christmas day was lovely. We got up reasonably late, then took our time opening the presents left from Father Christmas. Yesterday we were entertaining my mam and boy was she looking forward to her ‘Christmas lunch’. She thought I was only joking when I said we were each only going to have one Brussels sprout – we had four each on Christmas day, what more do you want ! ! ! What with the two lunches, Christmas cake, crisps, mince pies, chocolate and wine, I dread to think how much weight we’ll have put on once the holidays are over. A while ago (2005 HBA Autumn conference to be precise) Paul was telling us about a particularly rough area he had to visit. I suggested that it might be the sort of place where you could leave a horse unattended and come back to find it on four piles of bricks. I’m now beginning to think he was referring to our area. Some of you will already know about the “scavengers” who scour the back lanes for anything that isn’t bolted down. Well yesterday they excelled themselves. During the afternoon two men emerged from the backyard of a house round the corner from ours and deposited two sofas in the back lane. Fair enough at any other time. It’s what you have to if you want the council to take things away. But a Saturday afternoon, two days before Christmas. By nine o’clock the local kids had pulled one across the back lane, blocking it to traffic. We looked out before going to bed at eleven, and both had vanished !!! Nine or ten o’clock on a Saturday night, two days before Christmas and they’ve got nothing better to do than patrol the back lanes looking for something to scavenge. We’ve seen things vanish before but never at this time. We once arranged for the council to collect an old cooker. I duly put it out, but before the council could come, we heard the sound of it being dragged away. We did the same with the old central heating boiler. This time it went bit by bit. Someone was making repeated visits with a spanner and taking away as much as they could carry. Really it’s a bit worrying, strangers out there in the dead of night – or even the middle of the day. OK, rant over. Good news. The new kitchen doors are fitted. Photograph to follow in the next few days. The kitchen is a bit busy at the moment. My mam has finally decided where she will be spending Christmas day. It’s with my sister. I’m happy with that as my mam came to ours last year and it means that for the very first time we’ll have a Christmas the way we want it. Because we have always tried to please everyone, we’ve spent Christmas day on the go and at times the day has passed with a blur. This year is going to be different. We can get up when we want – instead of having to set the alarm in case we oversleep. We don’t have to stick to a rigid timetable - so what if the potatoes take longer to cook, we’re not going anywhere so don’t have to worry about being late. We can also do something we’ve longed to do – have a glass of fizzy whilst preparing the lunch. In the past one of us has been the taxi driver so couldn’t. However my mam is coming to ours on Boxing Day and she’s asked if we could do her a ‘Christmas lunch’. My sister and her family will be having their usual Christmas meal – pasta, pasta and more pasta. So this Christmas we’ll be having two Christmas lunches. It’s a tough job but someone’s got to do it ! ! ! The other day we were discussing who we’d each have as guests at a virtual dinner party. The only rule was we were not allowed to invite family or friends - past or present - other than each other. So here are my 10 dinner party guests (and why). Yesterday whilst I was at my mams, she announced that she wanted to get a mobile phone and also to get connected to the internet in the new year. We wanted to get her a mobile last Christmas but we were told rather bluntly that it would be a waste of money as it would be kept in it’s box, in a drawer. As for the internet we offered to sort it out for her before we went on our cruise so we could keep in touch via email. Again we were told no. However my mam has a habit of changing her mind so it didn’t come as no surprise. I then spent another hour trying to explain the difference between dial up and broadband and what web pages and downloads were. PS for lunch yesterday she made chicken and salad wraps. Guess what she asked me – yes did I want any tomatoes on it…. You’d think after all the years of me telling her I don’t like them, she’d finally remember. She then wiped the knife after cutting the cucumber. ‘Why did you do that’, I asked. ‘Because John doesn’t like cucumber’. a) She can remember that John doesn’t like cucumber but can’t with me and tomatoes. b) He wasn’t even there ! ! ! ! ! ! Two years ago my mam suddenly decided that she didn’t want to go shopping for Christmas presents that year, as it was would be the first Christmas without my dad and it was too upsetting for her. So she asked everyone if we could ‘donate’ some presents from the ones we had already bought so she would at least have something to wrap up. She didn’t decide this until the middle of December so there was some panic buying from Amazon to replace the ‘donated’ presents. My mam decided a couple of weeks ago that she had had enough of shopping so asked if we could ‘donate’ presents again. Whilst I was at my mams today (Christmas food shopping at Sainsburys – she asked a shop assistant where she would find the bread she got before, but could remember which kind it was – I kid you not ! ! ! Thankfully she was a very patient assistant so after twenty questions she found it…) she asked when I come on Friday, could I bring ‘her presents’. I mentioned this to John tonight and got a stunned silence. I had forgotten to tell him ! ! ! Gives a precise time when he can come out to have a look - and arrives on the dot. Rings up the very next day with a sensible quote. And can fit the doors two days before Christmas. As it’s the Season of Goodwill and all that, I’m going to be kind to B&Q. Instead of asking them for the money before the work is done, I’ve decide to pay the little man then get them to reimburse me. See, I do have a nice streak in me after all ! ! ! 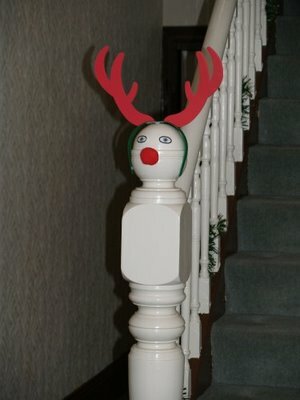 Yesterday we spent the afternoon putting the Christmas decorations up and it was also a welcome return to Rudy. He’s been many colours throughout the years – beige; mahogany; red and now ivory. As John was off work today we have a lovely long lie in, then it was off to the Chinese Restaurant for lunch. After my disaster with making mince pies last year, I had a change of heart and decided that I would still continue making them (instead of just buying them from Sainsburys as I had threatened to do) but only do them small batches. That was the theory any way. In reality it was a little different as my mam had such a good time two weeks ago when we made the cornbeef pies and the lemon and orange cakes for our Winter party, that she would like to help me make the mince pies. So yesterday, my car boot was full of the various things I had to take with me to my mams in order to make the mince pies – mincemeat, flour, margarine, tins, cutters etc. I’m delighted, nay ecstatic, to report that we made seven dozen and not one of them stuck ! ! ! Two weeks time she wants us to bake the lemon and orange cakes again. We’re trying to find a joiner to come and fit the kitchen doors. I rang a couple of them and sure enough they came out and give us quotes. However getting hold of them to arrange a date is like pulling teeth. I left a message on the little man’s answer machine saying I’d very much like him to fit the doors and could he give me a ring back to arrange a date. Having received no reply I tried again. Success I got to speak to him. He blamed his wife for not getting back (a likely story). As he was on a job, he didn’t have his diary with him but he’d ring me back that evening. That was six days ago. If he can’t be bothered to contact me then he doesn’t deserve my business. I decided to try the little man who couldn’t afford an answer machine again and actually got to speak to him. I nearly dropped the phone in shock as to how much he wanted to charge for fitting. £20 per door. We have 10 doors and five drawers. That’s a whopping £300 ! ! ! ! Ok, I know B&Q are paying for the fitting but that’s still an extortionate amount of money, especially when B&Q are expecting us to pay the joiner first, then to get them to reimburse us. Think again B&Q ! ! ! We do however have a standby joiner. His quote is a little higher than the first little man but definitely not £300. Plus we’ve got it in writing. PS an update on the overlocker. It’s still acting very stroppy (well it is a teenager….) so I’ve abandoned sewing for a couple of days until John can cheer it up. My overlocker is being temperamental - for those of you who don’t know what one is, it’s a machine which neatens edges of fabric. I’m busy making a top with the fabric I bought at Leeds market (£1 for a metre. Now there’s a bargain) and whilst I was overlocking the neck edge of the back piece, it decided to throw a wobbler. It does this occasionally, mainly when there’s just a bit too much fabric for it to stitch. I had thought there wouldn’t be a problem as the neck edge didn’t appear to be that bulky. It’s still not 100% but at least it should be ok to finish off my top, provided I’m extremely gentle and talk nicely to it. Once Christmas is out of the way I’ll get John to have a good look at it and maybe even give it a service. I certainly can’t be without it when I come to make my dress for Northampton ! ! ! We went to a garden centre today. The garden bits were cowering in the far corner, forgotten and neglected. Thankfully we found what we wanted, and joined the queue to get out, finally being served by the worlds most miserable shop assistant. So that was our Sunday excitement. Saturday was spent getting my hair cut and making a storage unit for Marie’s work room. We live such an exciting life. Actually ten years ago at this time of year we would be plenty busy. This weekend it was the “Wales Rally GB”. And awful name for an awful event. This used to be the good old RAC rally. We used to run the service area at Kielder, and I once ran an overnight halt at Gateshead stadium. How times have changed. The event used to last five days and there were something like 650 miles of stages, covering most of the country. North & South Wales, Forest of Dean, Yorkshire, Kielder, Hamsterley, Tweed Valley, Dumfries and the Lake District. Now all we get is a measly 200 or so miles, all of it in South Wales. And if you want to watch, you have to pay lots of money to enter the forests. The changes are all down to the desire to make the event (and all the other rounds of the World Rally Championship) more attractive to television. I’m pleased to say that audiences are waning and television is losing interest. Hopefully we may yet get our rally back.